Next Saturday, we celebrate Earth Day. On the prowl for column ideas, I found several during a recent visit to Florida. Perhaps I could write about how the population of south Florida is expected to double to 14 million within the next half-century. To accommodate explosive agricultural and residential development, the region’s natural wetlands have already been so altered that the Everglades has shrunk to half the size of its original three million acres. Or perhaps I could write about the widespread leveling of cypress forests. Bald cypress is prized for its beauty and its resistance to insects and rot. In the 1940s and 50s, loggers hardy enough to brave brutal swamp conditions in Florida and elsewhere clear cut vast stands of irreplaceable trees, many of which were more than 500 years old. Mindboggling, huh? Ultimately, though, I decided this Earth Day column should be about feathers. 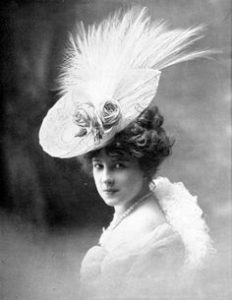 Feathered hats became a fashion craze back in 1870s. Stylish women sported large hats with wide brims elaborately decorated with silk flowers, ribbons and exotic plumes. Where did these plumes come from? Most of them from shorebirds—herons, ibis, roseate spoonbills and egrets– of Florida. By the 1880s, milliners were paying 32 dollars an ounce—twice the price of gold at the time—for plumes. Hunters worked tirelessly to meet the demand and were busiest during breeding season when the birds’ showy feathers were at their finest. They favored the densely populated rookeries of the Everglades, where they would shoot and then pluck the roosting adult birds, leaving the carcasses to rot. Unprotected eggs and newly hatched baby birds became easy prey. If they weren’t eaten by predators, the babies starved or died from exposure. On a “good” day, a single hunter could collect plumes from a hundred birds. By the end of the nineteenth century, an estimated five million birds per years were being killed for the millenary trade. Ninety-five percent of the snowy egret population was wiped out. At age 15, a young man named Guy Bradley served as a scout for a French plume hunter in south Florida. Bradley was so sickened by the wholesale slaughter he witnessed that he became a game warden. In 1908, when he was only 35, Bradley was shot and killed while attempting to arrest a bird poacher. Believing the hunter had acted in self-defense, a jury declared Bradley’s killer innocent. By the turn of the twentieth century, thanks to state and federal legislation, the newly-formed Audubon Society, President Teddy Roosevelt (a staunch conservationist) and a change in public attitude, the plume trade began to falter. It ended for good in 1920. The Everglades became a National Park in 1947, helping endangered shorebirds and other threatened wildlife begin a slow but steady comeback. If that story isn’t enough to make you support full funding for the Environmental Protection Agency and the National Park Service, I don’t know what is.